Rick Bieber, a producer of the original Flatliners back in 1990, has a new horror flick coming out in cinemas and on VOD tomorrow, September 29, 2017. The film is called Don't Sleep and Bieber directed, wrote and produced under his production banner Minds I Cinema. Screen Anarchy has an exclusive clip to share with you today in hopes that it might prompt some interest in the film. In this clip you will see actor Alex Rocco (The Godfather, Three the Hard Way and Smokin' Aces) in his final role. DON’T SLEEP tells the story of two lovers (Sherwood and Dean) who move into a guesthouse together on an estate owned by Mr. and Mrs. Marino (de Matteo and Rocco). When bizarre events begin to occur with increasing danger, the young couple must confront the horrors of a forgotten childhood. 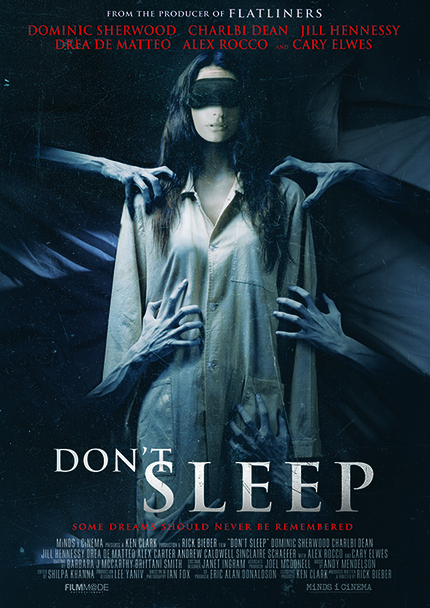 Don't Sleep stars Drea de Matteo, Cary Elwes, Dominic Sherwood, Jill Hennessy, and Alex Rocco.